Hi Everyone! My name is Jim Jankowski. I’m the Group Manager for Certified Security Solutions Secure Infrastructure Management team. This month we are kicking off our ‘Windows 7 Accelerate with System Center’ marketing campaign. Our first topic in this marketing campaign is ‘Accelerating Windows XP to Windows 7 Migration using System Center Configuration Manager 2007’ which includes a 5-part how-to video (available here) as well as this corresponding blog posting which provides additional relevant information not included in the video. To start with, you might be asking yourself, why should I deploy Windows 7 when Microsoft has already announced the release of Windows 8 and just announced the availability of Windows 8 Consumer Preview? The answer depends on how far along you are with your Windows 7 deployment or deployment planning since a typical Windows deployment takes 18 to 24 months. The other consideration is how soon after Windows 8 is released, will software vendors address any business critical application compatibility issues with Windows 8. Since Windows 8 will have a brand spankin’ new interface and be designed for touch as well as keyboard, pen, and mouse, chances are it will take software vendors some time to address application compatibility issues. Since the end of support, or what we like to call WinXPDOA, is 25 months, 5 days, 12 hours, 38 minutes, and 40 seconds away (at the time I’m authoring this blog) and the fact that Windows 7 has been out for quite some time now, is extremely stable, reliable, and secure and can run on most systems that run Windows XP today we feel are the reasons why you should deploy Windows 7 now. And, if your automated Windows operating system deployment process is designed properly now, dropping in Windows 8 for deployment to more modern based touch devices when the time comes should require minimal effort. April 8, 2014, is it Y2Kv2? So why do we think it might be Y2Kv2? In retrospect, the biggest problem customers had with Y2K wasn’t the doom and gloom that was predicted, it was the lack of available resources to help with Y2K remediation. The result is what usually happens when demand greatly outweighs supply, which was a significant increase in the costs of resources as 01/01/2000 approached. All that being said, now is the time to start your Windows 7 migration. One of the areas I briefly talk about in my ‘Accelerating Windows XP to Windows 7 Migration using System Center Configuration Manager 2007’ how-to video (available here) is the ‘ConfigMgr Client Health Status Reporting and Remediation’ capabilities included with the R2 release for ConfigMgr 2007. Next to BIOS upgrades, the health of your ConfigMgr clients is probably the most import thing to address prior migrating your Windows XP systems to Windows 7 using ConfigMgr. Simply put, if a ConfigMgr client is not healthy, the migration process will fail and your Windows 7 deployment project will be in jeopardy of crashing and burning. 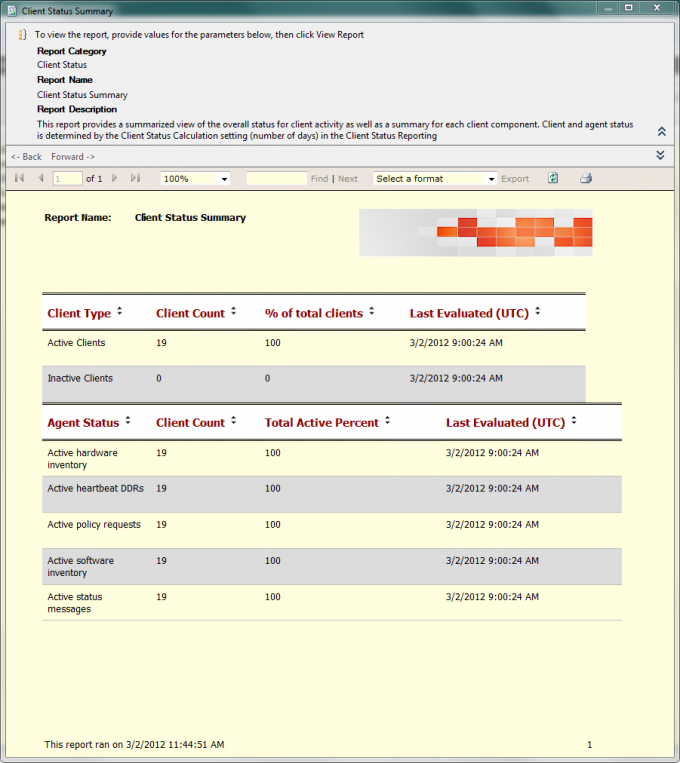 By deploying the Client Status Reporting included with the R2 release for ConfigMgr 2007, you will be able to leverage a set of tools and reports to more easily check the status of the ConfigMgr client across your organization and identify the systems that need remediation. 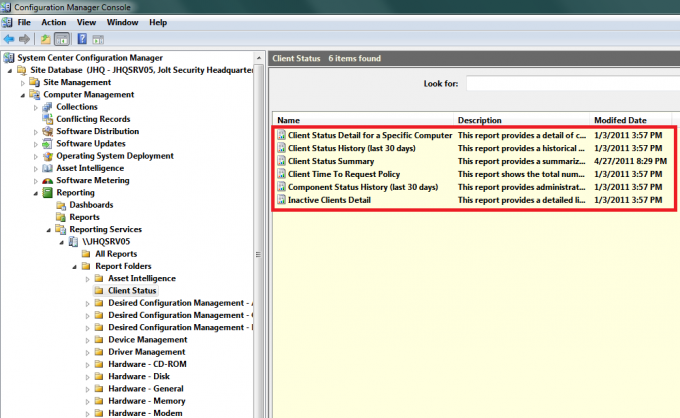 As for remediation, based on our experience with customers, 90% of all ConfigMgr client health issues can be addressed by uninstalling and re-installing the ConfigMgr client. Perform an automated full installation of the 32-bit or 64-bit versions of Windows 7. A full installation would include the operating systems, core applications, departmental applications, security tools and related corporate configuration settings, and the backup and restore of user files and settings. Perform an automated clean installation of the 32-bit or 64-bit versions of Windows 7 for lab, development, testing, training, or application packaging systems that do not need a full installation. 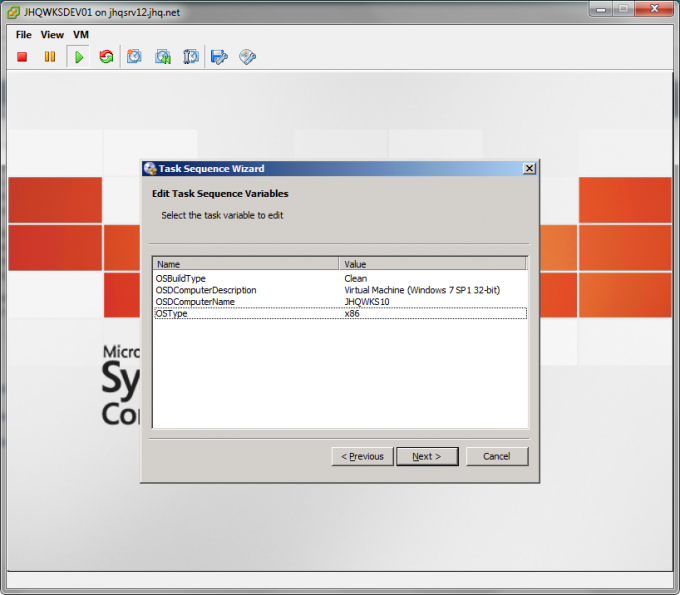 Perform an automated image build installation on a reference computer to create the standard 32-bit and 64-bit Windows 7 images used to deploy windows 7 during the full and clean installations which will typically eliminate the errors that occur when manually building an image. I cover this in detail in my video, but what I don’t cover is how I set the corresponding task sequence variables. 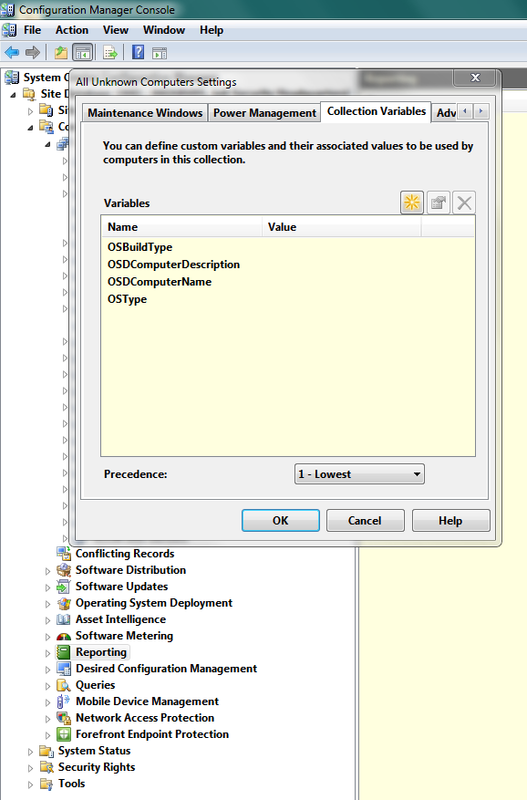 I do this using ‘Collection Variables’ which are set at the collection level (as seen in Figure 3 and Figure 4 below). 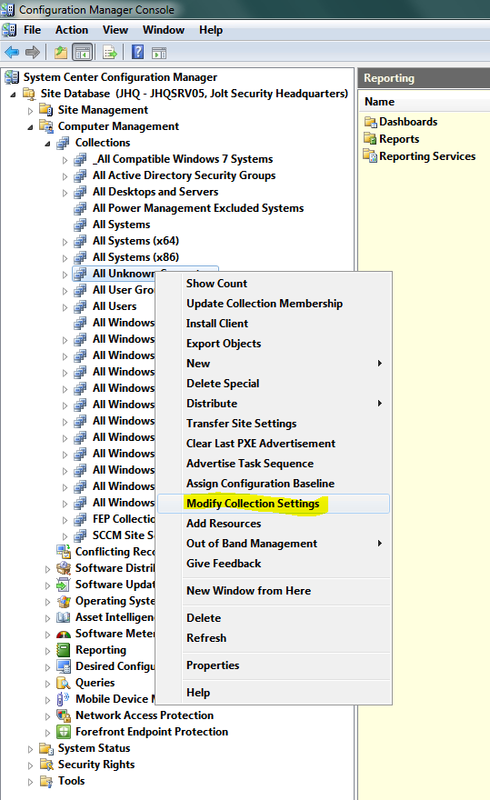 Note that there are other way to do this such as prompting for the corresponding information from within Windows PE using the new Microsoft Deployment Toolkit UDI (User Driven Interface) feature or from an HTA application like I showed in my video password protect the Windows 7 deployment task sequence, but for many customers, using ‘Collection Variables’ is more than adequate. The task sequence variables I prompt in my video for are used to set the computer name and computer description as well as OSBuildType (Full, Clean, or Build), and OSType (x86 for 32-bit or x64 for 64-bit version of Windows 7). Refer to Figures 5, 6, and 7 below to see how the ConfigMgr task sequence will prompt for this information when Windows PE boots and starts the Windows 7 installation task sequence for a new system.